It was a fluke, really; an impulsive, tragic, “I’m invincible” kind of thing to do. The energetic nineteen-year-old catapulted himself into a back flip, landed wrong, and snapped his neck. Kevin is what I call a real Christian. So is every member of the Thorson family. They’ve walked out an arduous, inspiring faith journey, starting with their refusal to pull the plug on Kevin (which is what one of the first doctors who saw him suggested). 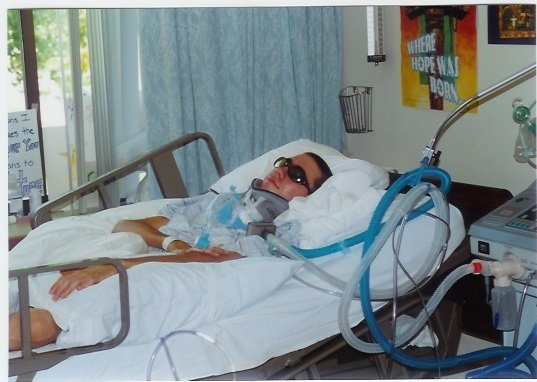 Due to a spinal fracture rendering Kevin paralyzed from the neck down and unable to breathe without a ventilator, physicians told his parents he’d have to be cared for in an institution. It would be impossible, they said, for the family to take care of Kevin at home. But the Thorsons know the God of the impossible. They began learning what it would take to bring Kevin home. Family members took turns staying up all night to make sure Kevin was breathing. Kevin’s mother Pam eventually earned her LPN degree to care for him. Twenty years later, the Thorsons are still living the impossible, day after day. That’s what real Christians do. They suffer well. They love well. They don’t give up. They keep the long view in mind. And they’re okay with making sacrifices along the way. #RealChristians suffer well. They love well. They don’t give up. They keep the long view in mind. And they’re okay with making sacrifices. I’m privileged to know people like the Thorsons. I love being connected with brothers and sisters who are ordinary yet extraordinary. They help me remember my faith means more than attending church, listening to worship music, reading my Bible and telling God my needs. So do you and I. 1. Do I embrace suffering? By embrace, I don’t mean morbid resignation, like Eeyore. I’m talking about accepting what God is doing in the midst of hardship, and praying more than you complain. Jesus promised us we would suffer if we follow him. How will we take it? 2. Do I love well? Am I so caught up in my own interests that I fail to make myself available for the needs of others? Do I have eyes and ears — and room in my schedule — to pay attention to where I can help? How’s my level of compassion, especially when it’s not convenient? 3. Do I give up too easily? Perseverance is the hallmark of mature Christian character. Real Christians aren’t quitters, because they know where to get the power to hang in there. 4. Do I keep the long view in mind? Our culture is all about instant gratification. However, Christian hope is future-oriented. The trials of life refine us; the reward comes later. Do I consciously look forward to my heavenly reward while rejoicing in how God is transforming me now? 5. Do I make sacrifices? It’s easy to give when we have a little extra income, or pray when we happen to have the time and energy, or fast something we don’t really care about anyway. God is pleased when we offer the time, talents and treasure that we don’t think we can afford to give. Kevin and his family allowed severe hardship to grow their faith roots deeper. I hope I’m as real a Christian as they are. I’m also including the link to this post (and others) in the Resources for Further Study in the back of the Bible Study I’m writing in the hope that future readers of the Bible study will venture to your site and read your post(s). I know they will be encouraged and strengthened. Wonderful! Thanks so much, Jacqueline. Susanne, I know I’d like to repost this on my blog one of these days. It is powerful because it is true, and it touches us where we live. Thank you. This post left me in tears. Thank you for your kind words and encouragement. As we “live the impossible” each day, it is our great prayer that Jesus will be lifted high. His grace gives us the strength and courage for each day, in the same way that He abundantly gives to all who long to live an authentic faith. Many thanks for sharing our story. You are so welcome, Pam. You guys are an inspiration to many. I’m honored to tell your story.